New Zealand Encounters: Carringtons, Maori and Mountains. Among desolate ruins still remaining from the 2010 Christchurch earthquake and shining new buildings under construction, my sister Imogen, my nephew Mark and I, stood with a distinguished Māori scholar Te Maire Tau in front of the stylish façade of the tribal headquarters of Ngai Tahu. Welcomed into the elegant interior, we entered an office where we were introduced to Māori researching genealogy. Two of them rose from their computers and greeted us with a hongi: we pressed out noses and foreheads together in a traditional Maori greeting. What brought us to New Zealand? Why did the indigenous people of the Ngai Tahu Tribe occupy a headquarters resembling a high level corporate office building? Why on earth did they salute us as honored guests? The answer is a long story. 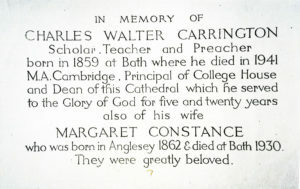 In 1902 my grandfather, Charles Walter Carrington, sailed from England to Christchurch to become the head of Theology at Christ’s College. In his earlier career as a railway engineer, he designed bridges and tunnels for the Great Western Railway and worked on complex reorganization of congested rails in London. But in 1885 at the age of 29, he took a new direction, studying Theology at Cambridge. He possessed many talents as a gifted water colour painter, wood carver, linguist, and musician. To these he added eloquent preaching; so, not surprisingly, he joined the clergy of the Cathedral and in 1913 became Dean. The Carringtons at the Deanery. (L-R) Hugh, Charles, Mother, Molly, Philip, Joan, Father Gerard,Chris. He arrived in the country with his wife Connie and five children, Philip (1892-1975), Christopher (1893-1916), Hugh (1895-1947), Charles (1897-1990) and Joan (1900-1984). Two more were born in Christchurch: Gerard (1905-1926) and my mother, Constance (1908-2008) who was always known as Molly. She grew up as a member of a lively family in a beautiful, very English-looking city close the Gothic Cathedral. Their first home there was College House, but when her father became dean, they moved to the Deanery a spacious house with wide verandas. Molly’s brothers followed their father by gaining distinction in their careers: Philip as Archbishop of Quebec, Hugh and Charles as respected historians and Gerard as an explorer. Joan studied at Oxford and married an American diplomat who was there as a Rhoades Scholar Molly, also a historian, published many books particularly on genealogy, English names and language. But two tragedies struck the family: Chris died in the Battle of the Somme in 1916. Our grandfather expressed his grief by carving an altar in his memory in the cathedral’s War Chapel. Ten years later Gerard, at the age of twenty, drowned in the gorge of Waimakariri River, while exploring on a raft. He had founded the Christchurch Mountaineering club and was building a hut for members in the upper reaches of the river. He even made maps for the government of uncharted regions in the Southern Alps. Carrington Peak, named in his honour, towers above the river valley. The hut at its foot, though enlarged, still bears his name. Gerard showed amazing scientific ability; as teenager he made many inventions, and was considered a mathematical genius. Our mother, an entrancing story-teller, described her early life in New Zealand; so Imogen and I could imagine her family in the Deanery where they lived and the beautiful mountains that we know well from our grandfather’s paintings. Finally, after talking of going there to see it for ourselves we decided, in February this year, to fly to Christchurch. Since we had no relatives there, and the cathedral had been severely damaged, our journey seemed a little late. But one new development opened up a connection to the Māori: it resulted from the exploits, almost a century earlier of our uncle Hugh. 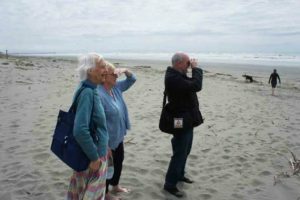 In the 1930s Hugh sailed around the coast of the South Island stopping at villages of the Ngai Tahu tribe, where he recorded the oral histories treasured by the elders. Over several years, he produced a valuable historical work, but, abandoned when he left to fight in the second world war, it lay forgotten in a library until Te Maire Tau, a Professor at the University of Canterbury, found it in 1987 and recognized its importance. He decided to publish it with the addition of introductions to the chapters, commentaries and illustrations. While finalizing it, he corresponded with our family and we shared information. We received copies of his beautiful volume entitled Ngai Tahu: A Migration History: The Carrington Manuscript in 2008. Te Maire is now the director of the Ngāi Tahu Research Centre at the University. Between 1986 and 1998, two Māori leaders, Te Maire’s father Henare Rakiihia Tau and Tipene O’Regan (the son of an Irish doctor and a Maori mother) worked on behalf of the Ngai Tahu tribe on a law suit against the New Zealand government for broken treaties and misappropriated assets in the 19th century. The final settlement awarded them land, money, fishing and agricultural rights, as well as the ownership of the nephrite jade, known as Pounamu found on their land. The Court also strengthened their Māori identity by bringing their formerly suppressed language into official use; it now appears in public places such as government offices. Even the labels identifying items in the museum and art gallery are in Māori as well as English. Consequently, the Ngai Tahu tribe gained both wealth and respect. Their leaders, determined not to squander their hard-earned gains, are directing the newly available funds to education, economic development and human services. They have defined ethical standards that guide them in their administration and express the goals of the tribe. The tribal headquarters reflects their status as an important social and political entity in a modern nation. While planning to travel to New Zealand, I exchanged e-mails with Te Maire Tau and hoped that we would be able to meet him. Soon after we arrived, he invited us to dinner at the elite George Hotel. We enjoyed a delicious meal and animated conversation with him, his wife Gabrielle and Sir Tipene O’Regan who had recently been knighted by the queen for services to the country. Sir Tipene, carrying an intricately carved staff and wearing a jade pendant, projected authority and dignity. He and Te Maire regaled us with history and assured us that Hugh Carrington had contributed significantly to knowledge and understanding of their Māori ancestors. While others had revealed threads of the history, it seems that Hugh wove many threads together. They even suggested that the facts established by Hugh helped in the law suit. At this point, it came clear to us that he and Te Maire were honouring us for our uncle’s achievement. I felt pride in the dedicated work of a relative I hardly knew, but extremely sad that he did not live to see the fine publication and to grasp the full significance of his own research. Dinner with Gabrielle (left) and Te Maire at their house. Te Maire also invited us to his family home in a Māori village for dinner with Gabrielle’s sister and her husband and another couple. I will never forget the experience of sitting at the long table, loaded with plates of lamb, vegetables and relishes, as well as a local delicacy, whitebait fritters, accompanied by excellent New Zealand wines. Our hosts really made us feel at home; we talked like old friends, laughing over amusing incidents and discussing serious issues. Our hosts told us about the revival of traditional culture, and we spoke of the parallel situation with the Native Americans in the northwest, which I have experienced first-hand. With that connection in mind, I brought him a print of a jumping orca by a Northwest Native American artist and a water colour painted by our grandfather near the mouth of the Waimakariri river. They reciprocated with a huge book on the Maori people for Imogen and pounamu jade pendant for me. I knew, at that moment, that I would wear it proudly. Two days later Te Maire picked us up in the morning, took us to the tribal headquarters, where we met some of the people who work there. We saw photos of distinguished members of the tribe including Chief Matiaha Tiramorehu who in 1858 wrote a petition to Queen Victoria asking the crown to set aside land for his people, as agreed at the time of government land purchases. The struggle that he began was finally resolved a hundred and forty years later in the settlement of 1998. We learned that today’s runanga (tribal council) administers a portfolio of investments including farming and timber production, property management, tourism, seafood. They hold a large stake in such diverse enterprises as the local bus company, milking systems, haulage, honey production and a whale watching organization. They base their decisions on five goals: (1) to protect and support authentic cultural identity. (2) to promote wellbeing in personal situations, health and housing as well as creating opportunities to meet aspirations; (3) to disseminate knowledge through education and cultural activities; (4) to protect and enhance the natural environment; (5) encouraging local development. While Māori were often regarded as second class citizens in the past, they now attract respect. As a result many New Zealanders, not previously associated with a tribe, are now attempting to join. That explains the importance of genealogy today. The interior was decorated with symbolic sculpture, most notably an intricate carving between the two elevators, a high wall showing photographs of marais (meeting houses) and a wall paneled with hardwood displaying natural, uncarved pounamu jade. We learned that members of the tribe have the exclusive right to mine, carve and market the jade. Their skilled craftsmen now control the quality of the beautiful jewely and other items made from it. After visiting the building Te Maire drove us about 75 kilometers south to The Banks Peninsula. On the way we saw the continuation of a devastating fire that we had observed the day before in the Port Hills on the south east edge of Christchurch. Tragically, it was still burning out-of-control. Then weskirtedt a huge lake near the coast at sea level, named Te Waihora (known to the English as Lake Ellesmere). Te Maire told us that this important wetland has always been an abundant source of eels, a favorite food for his tribe — they are dried in the sun or smoked for storage — but that, in recent years, water pollution has slowed the growth and reproduction rate of the fish. The Runanga is currently seeking means of restoring the ecology and achieving sustainability. These two sights reminded us of the fragility of the environment. Leaving the lake, we climbed through beautiful, country, and descended towards a large inlet from the sea, known to the Māori as Long Harbour. Te Maire also told us that French colonists had planned to claim Akaroa for France in 1840, but were forestalled when the officers of British ship planted a Union Jack on the shore. As he pointed out into the harbour, I could imagine a three-masted, square rigged ship entering the harbour. At the small nearby village of Onuku where officials signed Treatyof Waitangi in 1840, I was thrilled to visit a striking example of Māori architecture: the Marai (meeting house). 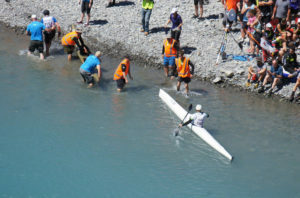 It was also here that Jenny Shipley, the Prime Minister of New Zealand, delivered the Crown’s apology to the Ngai Tahu in 1998 at the conclusion of the final settlement. The community completed this new Marai on the historic site in 1990; they dedicated it to the memory of their beloved forebear Amira Puirere, who died in 1944 at an age of over 100. A team of wood carvers led by Eric Korewha created the symbolic ornament over a period of four years. Crowned by a large figure on the peak of the gable portraying the Ngai Tahu paramount chief Te Maiharanui, it expresses tribal identity and pride in ancestry. The Marai serves a place for important ceremonies as well as regular social gatherings. We made other links with the Carringtons as well. Of course, we gazed at the ruins of the old cathedral designed in 1864 by George Gilbert Scott and completed in 1904, just nine years before our grand-father arrived in Christchurch. I felt relieved that the earthquake did not s trike until after my mother died in 1908. We met with the bishop, Victoria Matthews who showed us the new cardboard cathedral. She assured us that the plaque in the old cathedral commemorating our grandfather remains intact on the wall, and that the altar he carved for Christopher in the War Chapel is undamaged, though covered with bird droppings. She explained that no one is allowed inside because of the danger of further collapse. We gave her my grandfather’s painting of the Deanery which is shown on this blog,, and a copy of one he made of Halley’s Comet coursing through the sky over Christchurch Cathedral spire in 1910. Although College House and the Deanery no longer exist, we visited the museum and the Botanical Garden, both close by, where my mother played with Gerard. Like the museum, The Colonial Medieval buildings of Christ’s College, where my five uncles went to school over a period of twenty-five years, survived the earthquake with only minor damage. We were able to go into the library and find two whole shelves of books by Philip, Charles and Hugh. Imogen contacted the Christchurch Trampers Club, an offshoot of the Mountaineering Club founded by our uncle Gerard. They invited us to speak about him briefly at a meeting, so we made a connection there too. We told them a little about Gerard, and pointed out that when C. W. C first arrived in Christchurch the people were focusing their energies on the building of a “civilized” city. Gerard became active in the opening up of the Southern Alps at a time when people could devote time to discovering the sublime mountain scenery in their region. Imogens’s friend Jenny Abrahamson (whom Imogen had helped with genealogy in Devon, but never met) personified the legendary New Zealand hospitality; she helped us in many ways, welcoming us at her house, taking us on a tour of the city, providing maps and information and loaning us a car . She drove us to Gerard’s grave in Springfield, near the Wymakariri River. On that day we watched a stage of a Coast to Coast Triathlon at a place where competitors, who had already run and cycled a long way and paddled down the river in Kayaks, jumped out of their kayaks, ran up a hill and rode on their bikes across the bridge on which we stood. A sign there announced that they still had 73 Kilometers to go. We saw this contest as part of Gerard’s legacy. It was wonderful for us to see the river we had had imagined for so many years at various places, but it was tantalizing to see the valley turning north-east behind a mountain in the middle distance that obscured Carrington Peak. So, I illustrate the view with my grandfather’s painting that shows Gerard’s Mountain. I am very happy to have made this journey with Imogen and Mark, and to have been welcomed by the New Zealanders who gave us such a rich experience. It was sad to see the aftermath of the dreadful earthquake that destroyed the cathedral where our grandfather was dean and much of the city. No decision has been made about its replacement, but the city is reviving, phoenix-like. The strength of Māori, today, both culturally and economically, as well as its influence on New Zealand society, is inspiring.